The 2018 Macbook Air comes with a dual-core 1.6GHz Intel Core i5-8210Y processor and 16GB of RAM at best. 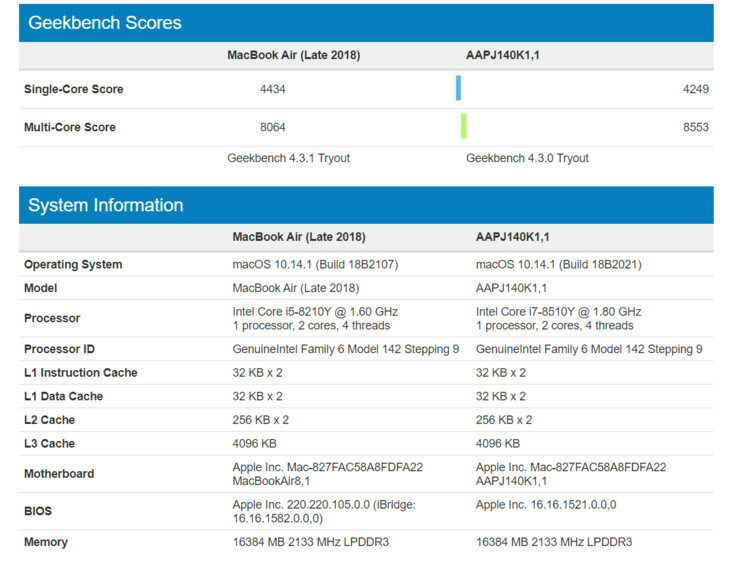 A suspicious new listing on Geekbench 4 details an Apple laptop with the same motherboard as the Macbook Air, but with a faster i7 chipset. Could this have been an early prototype, or is there a better class of affordable MacBook coming soon? The MacBook Air was recently refreshed for 2018 with a new low-power Intel Core i5 processor, a spec bump to a maximum 16GB in RAM and a Retina-style display. Therefore, the best it has done on tests such as Geekbench 4 is 4434 in terms of single-core performance and just over 8000 in multi-core performance. However, it now seems that Apple were at least thinking of doing more for the 'entry-level' Macbook. 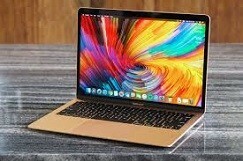 This impression is given by the discovery of a similar device with Apple branding and the same OS as the MacBook Air 2018 (macOS 10.14.1 (Build 18B2021)). It also has the same motherboard as the existing laptop, as well as a similar BIOS number. However, it only has a model number (AAPJ140K1,1) instead of a product name. This putative MacBook version, however, has an i7 chipset in place of the Coffee Lake dual-core i5 of the Air 2018 models on sale now. This processor, which is also 0.2GHz faster than the i5-8210Y in question, allowed the mystery laptop to beat the most recent multi-core scores associated with the known MacBook Air by a decent margin. However, its own model number (i7-8510Y) is not found in Intel's ARK database. However, it has also shown up on GFXBench 4.0. It is difficult to know what to make of these new mystery benchmark listings. On one hand, it is possible that Apple had plans for an advanced version of their most affordable laptop (or subsequently dumped the same). On the other, it makes little sense for the company to release anything that might cut into the sales of other, pre-existing MacBooks with i7 processors of their own. All in all, a more powerful MacBook Air for November or December is not a likely prospect.